Let’s go just a few centuries back in time. The most widely consumed wine of the time was Malvasia, which arrived from the domains of the Most Serene Republic in the Aegean Sea: Dalmatia, and Istria. It is no accident that many streets and alleyways gave homage, and still do, to this centuries-old tie between true Venetians and their wines, to the point that they bear names such as “grape street” (calle dell’uva), “Malvasia arcade” or “bridge”(sottoportego e ponte della malvasia), “wine street” (calle del vino), “shore of wines” (rive del vino) etc. And, in part, to trade in wine, Venetian nobles undertook long trips. This was the case of nobleman Pietro Querini who, in 1431, searching for new routes for trading in Malvasia, was shipwrecked near the Lofoten islands, situated beyond the Arctic circle, where he found another precious merchandise: stockfish! Well, if for many stockfish has no meaning, they will surely salivate when they hear the word “salt cod”, a delicious Venetian dish which has become very famous in its two different versions: in the style of the city of Vicenza and in the Venetian style, the latter easily recognizable because it is served in a creamy sauce. 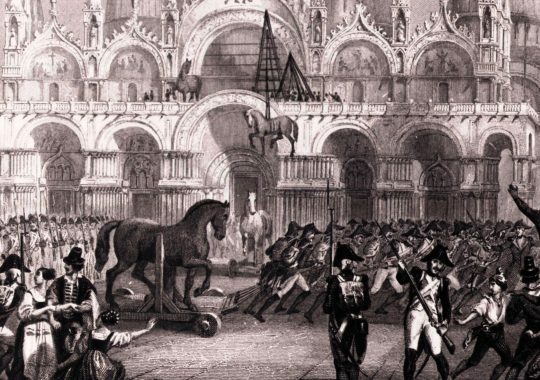 Once again, to give readers an idea of to what extent wine was prized in Venice, we shall recount this anecdote: in 1339 the government of the Most Serene Republic, to limit its consumption, reduced the number of taverns. And it took not only this step: it prescribed that “pure” wine (i.e. not watered), could only be served to foreign visitors. Referring to the wooden poles sunk into Vencie’s canals to channel and guide traffic on the water. Venice, however, was not simply trade and commerce: to demonstrate the culture and the desire for knowledge of viticulture it should be remembered the very first publication of a treatise on the subject. The De vini natura disputatio of G. B. Confalonieri, where the characteristics of a wine and its various types began to analyzed, was published in 1535 and is considered the first treatise on oenology. Over the course of centuries, wine and the vine reached the city; the vines were cultivated in various walled gardens owned by noble families and in convents. It was particularly within the various ecclesiastical complexes that the vine – symbol of the home, fertility, and union with the divine – was cultivated with patience and dedication by the monks. 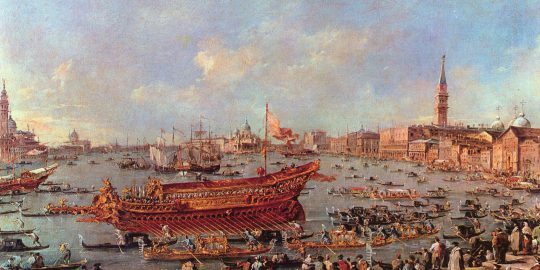 Venice saw the fall of the Venetian Republic, first with the arrival of Napoleon Bonaparte and then with the Austrians; the face and the customs of the city changed. The few convents which remained active, in order to keep the tradition alive, continued the cultivation of the different grape varieties utilized in the previous centuries, bringing them down to today. Only in the year 2010, under the impulse of the Consortium of the Wines of Venice, was a collection of the various grape varieties found within gardens and cloisters of the city on the lagoon created. A “treasure” of varietal bio-diversity now under the care of the monastery of the Discalced Carmelite order.